It is no secret that squirrels are always misunderstood. Sometimes they are cute and cuddly but most of the time, they are really annoying – a problem for most birders that definitely needs to be resolved. Many birders would say mean words about the squirrels. It is not the first time I heard birders cursing the squirrels for many things: birdseed thieves, trashes your garden and damaged your bird feeders beyond recognition. The worst is possibly describing them as terrifying miniature hell-beasts that has the capability to turn your place into almost inhabitable state. 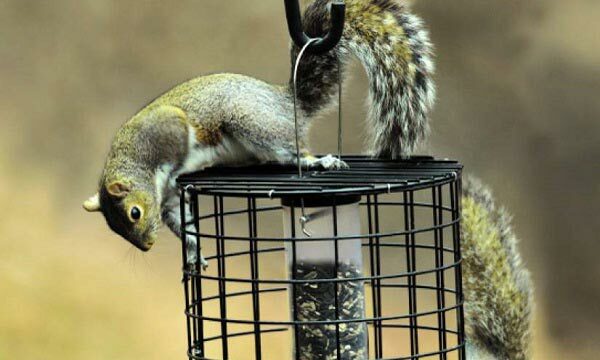 Putting some barriers in your yard may be a great idea, putting enough distance of the feeder to the ground is another one but getting the best squirrel proof feeder may actually be the best solution so far. 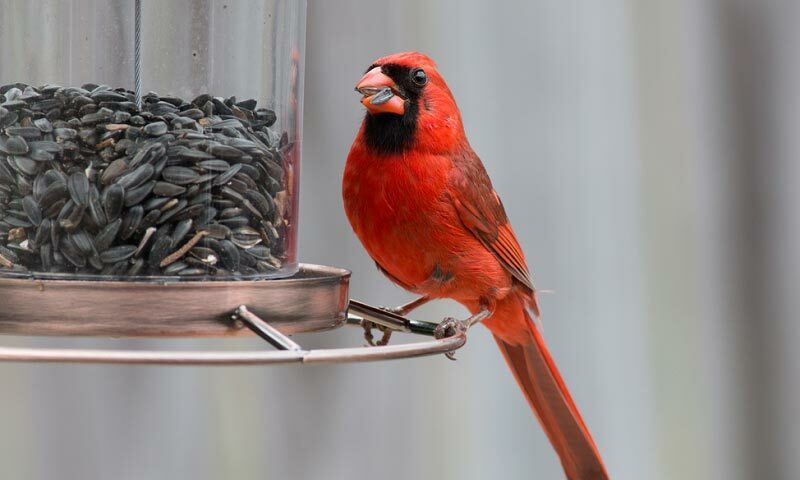 There are many bird feeder types out there but here are some that truly deters the squirrels from ransacking your precious bird feeder. There are beautiful things about this feeder. It is not only manufactured with a lifetime warranty in mind but Brome ensures that it is can be the best one for your bird but not for the squirrels. 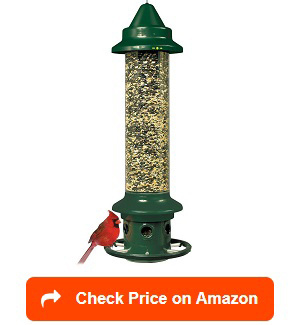 I like the product because there are no way squirrels can cheat the feeder’s system. This is because the weight of an adult squirrel automatically closes the shroud, which means that the squirrel is denied access to the seed. That’s a futile exercise, eh. Sometimes, squirrels are truly fascinating creatures. They have this ability to chew even the hardest of wood or the sturdiest of plastic. But with Brome’s squirrel buster, they can never beat RoxResin, a chew proof material. Of course that’s just one of the great things about this. The overeating squirrels will never get to the seeds as the dispensing holes are way too small for the squirrels to get through. Probably the best anti squirrel bird feeder there is. 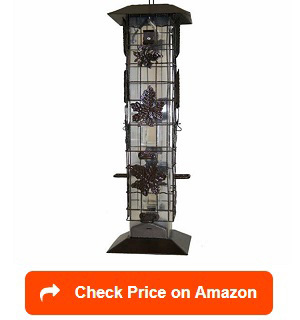 The Droll Yankee squirrel proof bird feeder is true to its description, “squirrel proof” as no squirrel can get pass through the feeder’s ‘rotating’ system when a squirrel tries to steal some expensive bird seed. I love it that I can rest my mind while the feeder does its work of shoving away squirrels from its perching system. The yankee flipper has a motorized, weight activated squirrel proof system so the minute a squirrel hops on the feeder, it just spins unconcontrollably, disturbing both birds and squirrels alike. The birds can fly away but the squirrel has to solidly fall on the ground. Now, that’s you call karma for the pesky squirrel. Squirrels who happens to successfully hop onto the feeder gets a spinning game until they give up on their quest – and almost always, the system is successful. For some reason, I have always been very bias towards Perky Pet products. And why not when they manufacture such great equipment and food making birders very happy. There are many good things about this product: tray style feeding system, sure lock cap, and rust-free material. The price, lower than most of its kind on amazon. Yes, I love the product for those reasons alone and more. Among the pretty things about this product include the panoramic 360 degrees view. This ensures that I can watch the action from all angles. More than those features, the squirrels that come cannot open the lid keeping your seeds safe from this incredibly annoying creatures. Well, nothing is better than an enclosed feeder if you are trying very hard to deter those squirrel away. That’s exactly what Woodlink bird product company was thinking when they put in together the Absolute II. 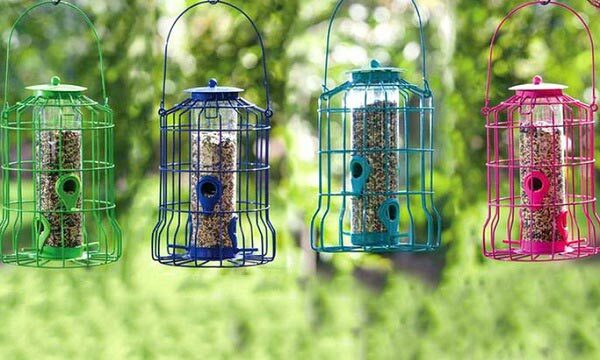 I am personally recommending this resistant bird feeder because even if the squirrels get all the incisors ready to chew off plastics, this product, made of steel can surely withstand it all. 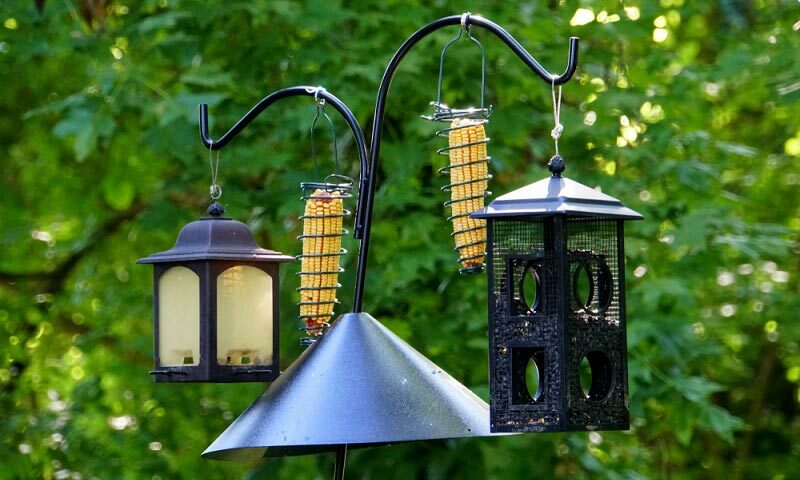 Even if the system is much like other squirrel proof feeders – weight of the squirrels causes the automatic closure of the access to the seed, this Woodlink squirrel proof bird feeder has more beneficial features including double sided entry, seed saver baffle and adjustable weight settings. I never regretted paying a bit more for this product as its benefits far outweigh the cost of it. 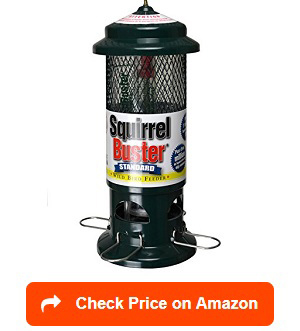 The 12 pound mixed seed capacity also ensures that I do not need to be stingy with refill for fear of squirrel attack nor be scared of running out every single day. Infact, it might take few days before a refill is necessary. As a suggestion, in case your squirrels are geniuses, try quick fix such as rubbing oil or petroleum jelly into the feeder pole and make this squirrel resistant into 100% squirrel proof. The word ‘buster’ is the best part of this product and I definitely love such idea. Brome made it very clear, a similar feature of their other squirrel buster feeder. Of course, there are different ways of sending squirrels away: putting oil on the pole, hang it away from any places squirrels can use such as fence or ledge and yes, purchase a an effective squirrel feeder. I think another good thing about this squirrel buster is that it is very easy to install – it can be dismantled by hand into individual components without the need for complicated tools –install by hand. I recommend it because I can control which bird size should feed on this feeder through its adjustable spring mechanism. Well, for someone who wish to consider prices, this buster is also money saver, yet of quality – a real deal. 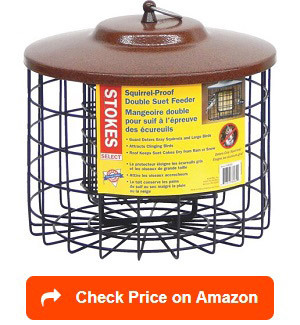 This is one of those products you don’t know you can’t resist because it surely does its job – keeping squirrels out. The cage says it all, at the very least. No suet will ever be touched by squirrels, unless it has become extremely small, that it will naturally fall off the feeder cage. There’s definitely practical in this feeder – the cage, which means no regular squirrels can go through even if they try their hardest. The lid, which is the only entry point can be lifted with enough force but not something a squirrel can do so you can relax without any hassle. I love that it can handle 2 suet cakes at once so there is no need to refill it as often as necessary. The cage metal spaces are big enough for birds to get in but too small for squirrels to do so hence the suet is very safe. Also, the tight fitting metal is weather proof ensuring the durability of the cage. 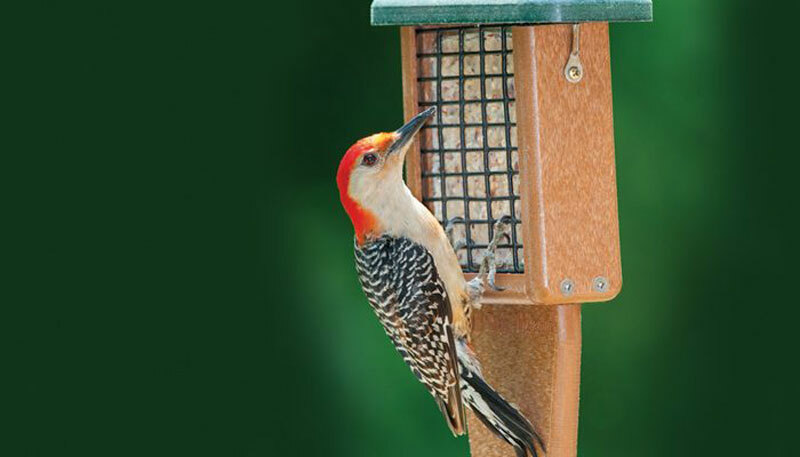 For its price, way lower than most suet feeders, part of it goes to bird habitat and conservation so if you are a bird enthusiast, there is nothing more noble than keeping the regular habitats of the beautiful birds protected. Yay! I always look forward to themed feeders and Perky-Pet did it just that. Beautiful, functional and practical design that is. The tiny birdhouse resembles that good old birdhouses I used to see a lot while growing up. So yes, this squirrel be gone product is just what I envisioned it to be. The cute design is a great addition to my yard and the while the birds love it as much as I do, the squirrels have no way of treating it the same way. Why? Well, it is because they can’t even get a share of the expensive seeds. If they hop on the bird feeder, the weight activated seed protection automatically covers the seed ports leaving the pesky squirrel with no choice but to hop off. But aside from it being squirrel proof, it also holds at least 8 lbs of seed, which means that I don’t need to refill it so often. Still, even if the bird house is full to the brim, I am at peace that they are going to be served to the ones it is intended for – birds. If you don’t agree with such benefits of this feeder, then I don’t know what else is great for you. Even expert birders rated it on the high five. Genius squirrel will find a ledge to stand on and reach for the feeder, reducing weight and tricking the weight detector. Be warned and do not place it anywhere squirrels can have access to. When it comes to beautiful designs, without a doubt, perky-pet leads the market. This squirrel be gone product is a perfect example. 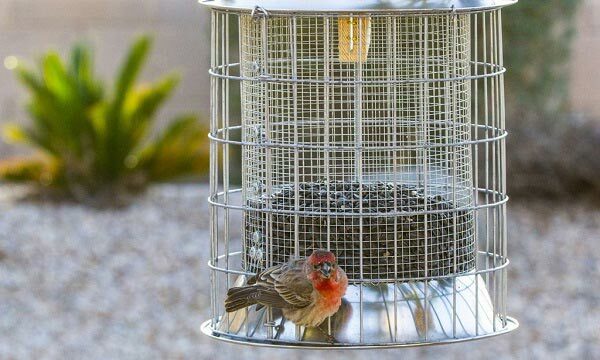 The square design, the leafy steel that accentuates the cute feeder is a constant reminder that a bird feeder can contribute to backyard design as well. 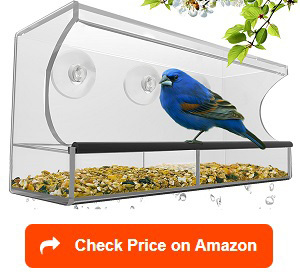 In addition to the design, I recommend this feeder for various reasons: 6 ports, small enough for birds to peck, weight activated cage against squirrels and steel materials against chewing. These means that no matter happens, your beautiful cage will never be damaged (chewed on) or ransacked (steal seeds) by the birders main enemy – squirrels. Perky pet even claim it to be designed for birds’ paradise, and I believe the claim is true. The decorative leaves even cover the ports when squirrels are on it. Such design is functional and aesthetically pleasing at the same time. The only downside of this beautiful product is when it meets a squirrel patient enough to chew on the plastic container. 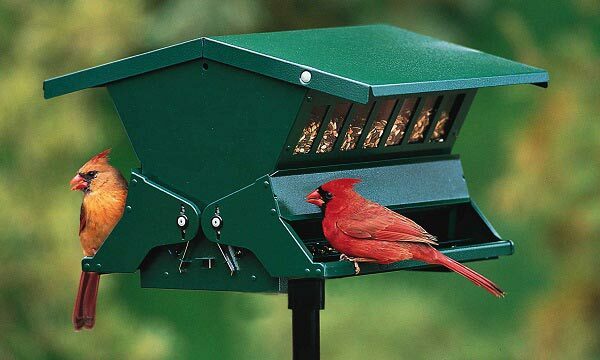 Still, it is worth every try as you both can get a feeder beautiful enough to make your yard even nicer. It is way cheaper than most products too. No installation needed. Just hang it. The feeder on its own is great. The cage is well made that it can surely frustrated squirrels. Not that it is impossible but it will be very hard to get it. Considering weight and body structure of the squirrels, I bet a dollar they will just go away flustered that all attempts fail. I like this cage tube for this mere reason: impenetrable. The seeds are kept safe in a plastic tube in the middle of the round cage and while small birds enjoy the treats, squirrels have no choice but to watch from the sidelines, in frustration. It has four seed ports so you can only enjoy watching the colors of the birds, feeding from your seeds. The only downside is that the metal cage is too small to let larger birds so you will only get to see smaller songbirds. Not your perfect feeder but definitely worth having. 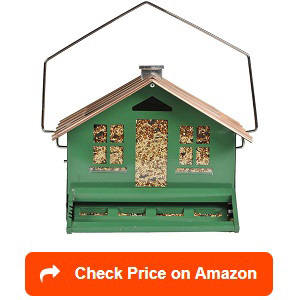 There are few things I am looking forward to bird feeder purchases: price, functionality and design. This cage tube feeder by Gray Bunny has it all so you can’t imagine how excited I am about having this in my yard. I am personally recommending this product for reasons such as entertainment; seeing the beautiful birds in style as well as watching the squirrels try but not succeeding from entering or getting a share of the precious seeds. The metal material is also chew-proof so it can surely frustrate the squirrels further. Its design of keeping the seed tube in the middle is perfect to keep the pesky ones out. The four feeding ports mean that you get to enjoy multi-colors at one time. On top of that it is very easy to fill. Although intended for smaller birds, some larger ones that have long beaks can find a way to partake in some of the seeds. Depending on whether you only want to feed smaller ones, this is a minor issue. Big birds that do it are quite smart or resourceful too. Otherwise, considering its price too, this seems to be a perfect one to have for the yard. When you do not wish to have squirrels visiting your yard, then you might want to consider what else can you do to keep them away. Good thing the pest off product of Roamwild does the job. Hence, I highly recommend this product. To keep you and your yard safe from these pesky ones. Unlike other regular feeders, this one has the capacity that is large enough to keep you at peace for quite a while—3 lbs. But that’s not the most important feature. The most significant ones are the built in cover and mini-baffle system that ensure no squirrels will ever get in between the seed dispenser and the seed tube. I also like the feature wherein the perch hatch automatically blocks the access to food if a large bird or squirrels hops into it. 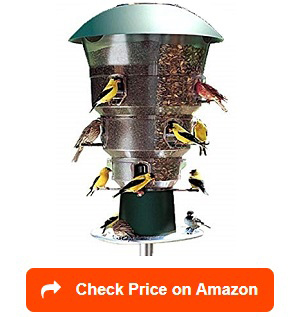 It opens automatically when they move away from the feeder. Isn’t that cool? Lastly, it is made with metal so no matter how much effort a squirrel puts in, there is no way, they can chew off the material. The seeds are protected too, by all means because of the built in weather guard. Easy to install. Just hang it and it’s ready to go. Perky Pet does not pay me yet for making their product more popular but they should. Why? Because I have been a bit biased over their feeders. They deserve it though. The feeders are surely well designed and work great in every aspect of birding. A close look at this squirrel resistant feeder tells me that I have to hold my horses in the purchase (but it is easier said than done) so I guess I will just have to enjoy the presence of it in my yard and oh boy, isn’t it beautiful. 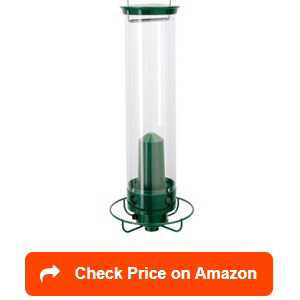 I like this feeder for some reasons: large seed capacity, removable seed cartridge, easy filling and cleaning, clear container makes it easy to monitor seed level and yes, the cage protecting the seed tube. The product never claimed it to be squirrel proof but it is certainly squirrel resistant, and it does deliver its promise. The feeder has multiple ports allowing many birds to perch and feed at once, some clinging onto the cage. The bottom opens up for cleaning making the birder’s job a tad easier and of course easy to fill. If there is a downside, it is probably the plastic. Can it withstand all elements:rain, wind and snow? That’s to be put to real test. Ever heard of the saying “big is powerful”? This is the classic example of when big things do deliver their promise of quantity and quality. I love the simplicity of the design—container that is big enough to carry 6 lb of seeds and the fact that is squirrel proof. The design, the levers at the bottom of the container deters the squirrels 100%. The perches, however, can be extendable making it more accessible to slightly bigger birds. So far, expert birders are happy and satisfied about this product as it does not only protect the seeds but frustrates the squirrel to the maximum. Hilarious scene when they try all tricks but nothing works. The only downside of this feeder? The raccoons but it did not promise to deter them so it is a good product through and through. 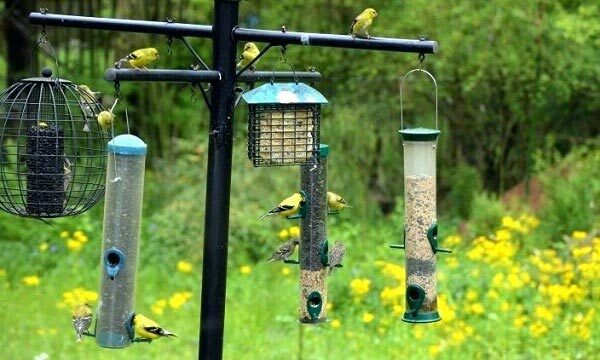 To avoid them ransacking your feeders – hang it higher! Totally innovative (and a bit harsh) and absolutely funny to watch squirrels scurrying away from the feeder. The secret – little shock scaring these pesky pests away. I can claim that it is probably one of the best (if not the best) squirrel proof feeder in the market today. The tiny shocks proof the feeder and only affects squirrels, raccoons and other unwanted species. They do not get hurt though as the electric shock is too tiny to do any harm. Birds are totally safe though. While the process maybe a little too much, the pros outweigh the cons. It is powered by a 9 volt battery, which needs constant checking to ensure effectiveness. A little more zap can go a long way to either make the squirrel try again or go away permanently. Many chose the latter. 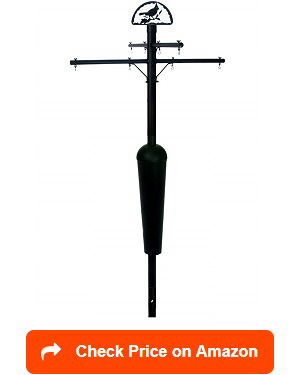 While it may be very innovative, it is quite hard to install in on pole. Hanging it on a tree is still a great option as long as it is within birds’ flight vision. There is something great about having a weatherproof bird feeder. They are weather resistant so you do not need to worry about having to clean the mess after a rain or a strong wind. I like this feeder for several reasons: it is made of metal alloy, which means that even the strongest squirrel tooth is no match in case they want to chew, and anti-bacterial, which means that I do not have to worry about constantly cleaning it. It is coated with anti-bacterial solution protecting the birds as well as humans for possible bird diseases. The only downside of this feeder is its weight – the thin materials makes it ultra light to the point that it is as thin as paper so a strong wind may be able to blow it away if it is left unsecured. But once properly secured, it should not be an issue. This is not the first time I reviewed this feeder but I won’t stop saying great things about it because it deserves it. 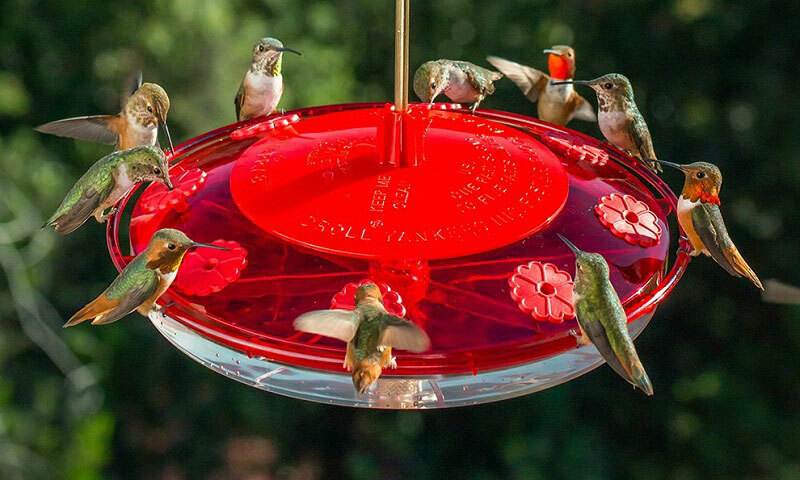 Nature’s Hangout did a great job at coming up with an innovative design of small, clear plastic and well-protected feeder. I love the design as it gives me unobstructed few of the colorful birds from my kitchen window. And I mean it when I say ‘birds’ as other pests like squirrels or raccoons have no way of reaching the feeder nor climbing the glass window. The price may be a bit high for its category but it’s all worth it. The suction stays on for a long time so no need to replace it as often. As long as in it placed in the middle of a glass window, higher than what a squirrel can jump to, your birds and seeds are all safe. Experts rated it as 5. Reviewing this squirrel stopper is no fret because it really works. There are many baffle sets available but this one does not just works, it is aesthetically pleasing too – a good addition to your backyard. The victorian look at the top of the pole completes your yard, definitely. 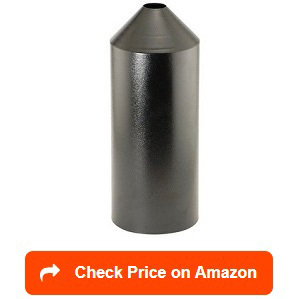 I am recommending this squirrel stopper pole because of its inverted cone-shape baffle, adjustable to your liking, depending on how big your feeder is. It is made of 16-gauge steel that means no chewing squirrel will ever get through it. While it can be a bit costly, it is worth every penny and saves you more from buying new feeder each time. 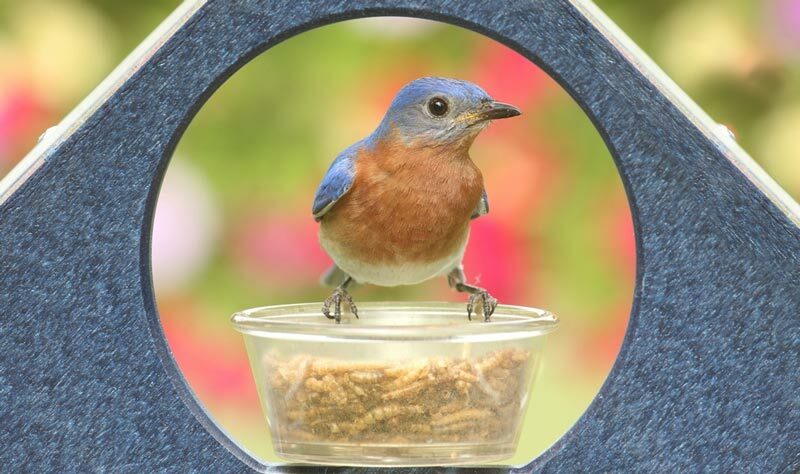 Just make sure you mount it 5”-6” above the ground and your feeder is safe from any intruders—except birds. Of course, the squirrel baffle is the birders best friend. While there are many feeders that sort have answered the need to fight squirrels, nothing beats the good old baffle. So this product will never run out of style. What makes this very effective is the fact that it is made of textured powder steel making it impossible for the squirrels to chew on. Squirrels, even with their sharp incisors’, can’t break this material. 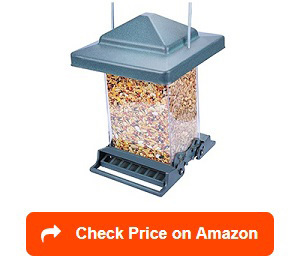 With that, your feeder will be ultra safe from squirrel attacks. I like putting baffle in my feeder pole for two reasons: because it keeps the squirrel away and because I can put a more expensive feeder without having to worry about rodents, squirrels or small animals attacking them. Yes. It is those times when you wish you have more feeder poles and just install beautiful baffles to protect them from pesky raccoons, squirrels or even bears. 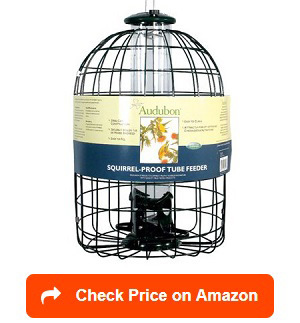 Audubon did a great job by coming out with this clear squirrel baffle, which can actually be used hanging or on a pole. I love it because it is not just stopping squirrels from feasting on the seeds but also protecting the seeds from the elements – rain, snow and strong wind. That is aside from its slick clear design. The only downside it that it is made of plastic and while it works against smaller squirrel, it may not be the case for bigger ones, more patient and resourceful in finding ways either by chewing it out or hanging on the edge of the dome baffle. Otherwise, even experts say it works perfectly well. Because it is a slide on, it is considered easy to install and thus ultra helpful for your feeder. To achieve this, you must adjust the distance between the feeder and the baffle to ensure efficiency. So far even expert birders rated this product as 5. 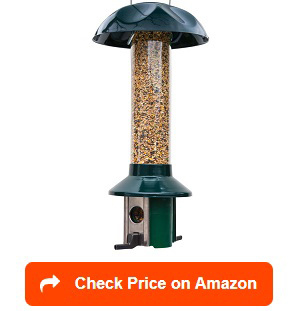 I love this product because it does not only deter squirrels but the cost itself makes it practical – affordable yet efficient – a rarity in the bird feeding world. 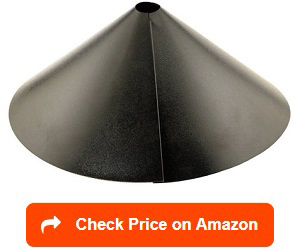 If installed with correct distance between the ground and the feeder, at least 4” to 5” above ground, this Audubon baffle is your perfect solution to squirrel or other critter problems. Squirrels can jump but they don’t jump any higher than those distance. Avoid putting your feeder near window ledge or the fence too. The only notable downside is that it can only work with straight poles because it is movable up and down only. As mentioned, squirrels are probably the birders biggest threat. This is the reason why there is a demand for bird feeders that baffles or deter these pesky pets away. Squirrel proof means making sure no squirrel will ever get to the seeds. Some of the most notable ones are the automatic weight system and baffles as barriers to the feeder. 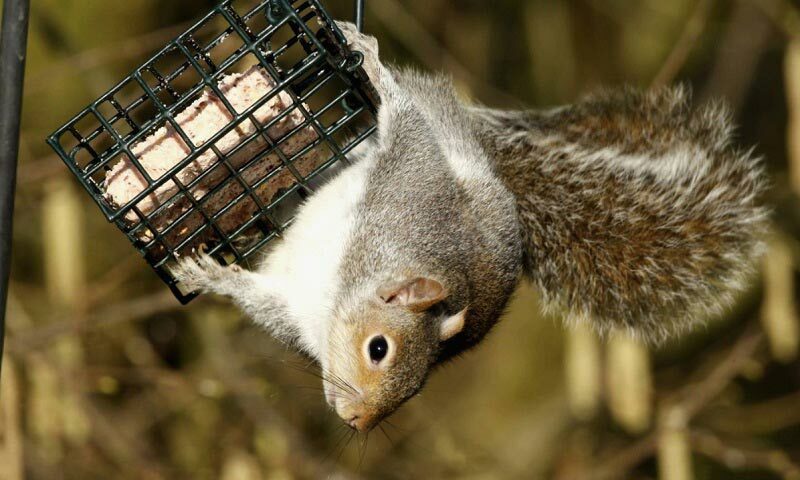 There are generally two ways of proofing the feeders: send the squirrel flying out in the air or not even allowing them to climb to the feeder itself. Most squirrel proof feeders has built in weight system that lets the squirrel spins away and fall when they hop onto the feeder and the baffle works well to bar them from even reaching the tip of the feeder. Check pesky-pets and Brome squirrel proof feeders. While is all right only just have one, putting both will ensure certainty and peace of mind. Torpedo Steel Baffles. Yes, the baffles are probably the most reliable ones. Nothing beats the squirrels than not allowing them even a sight of the feeder. Yankees Flipper. This is a fun way to send the squirrel away. The feeder’s spinning system ensures all squirrels are out of the picture the moment they try to get on it. The Closed System. Yes, denying them access to the seed once they almost see it is another fun way to frustrate the squirrels. Non-chewable Feeder. Squirrels have strong incisors but with metals, there is no way they can do it. Avoid plastic materials at all cost. They can be funny little guys and they also play a somewhat important role in the ecosystem. 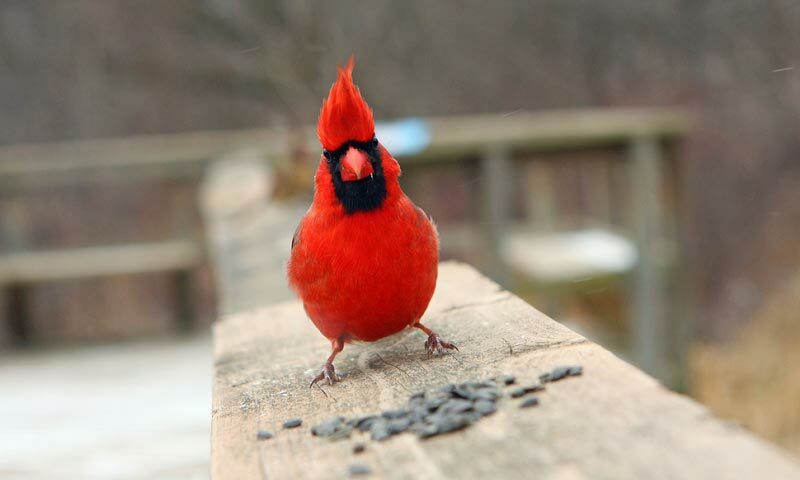 But if you intend to watch and feed birds only, then it is high time you send these little pests out of your yard. Attract birds easier. Without the squirrels, your birds will come in peace. The grey squirrels trying to steal the seeds will not terrorize them. Keep the feeder in one piece. One annoying thing about squirrels is their talent of leaving so much mess. Keeping them at bay ensures that you get to protect your feeder from possible squirrel party. Deter squirrels during the winter months. Squirrels come in groups during the cold months while the birds are low on energy. Terrorizing the pretty birds at this time of the year means they may not return for a long time after that. Proofing the feeder against squirrel is undoubtedly the best you can do to protect your birds, your yard and your feeder. Feeding birds is a rewarding experience but it can be frustrating at times too. Most of the seed types are attractive to squirrels as well so there is almost no way out of them. 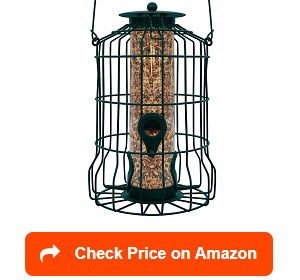 Unless, of course, you find the right squirrel proof bird feeder. So what factors do you need to consider when buying one? Get seed containers in cages. 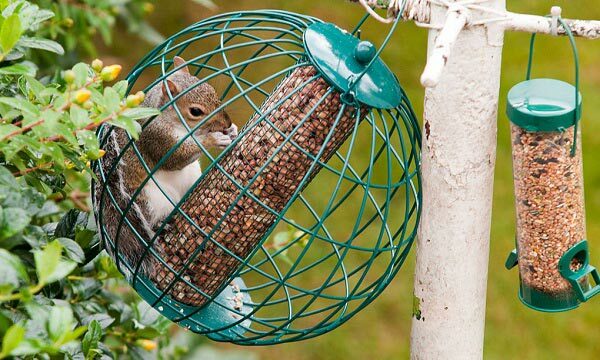 What better way to stop squirrel from even trying when they can’t, with their small legs, can’t even reach the seeds. You get frustrated squirrels but very happy songbirds. 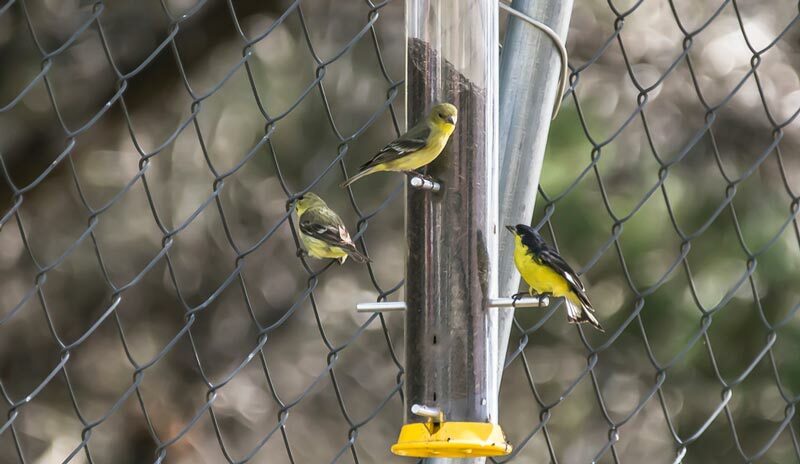 Having a seed tube in a cage will save you the time and effort of putting a wire cage around a bird feeder. By definition, baffle is a device used to restrain fluid, gas or loose materials. What then is a better way to stop squirrels than to baffle them away from the feeders? If you can hang the feeder in a thin horizontal wire that spins to deter the squirrels from getting closer to it, then it is probably a good feeder. This is because squirrels will ultimately tipped over and fall, leaving the feeder and the seed safe for the birds only. The seeds. While squirrels are hearty eaters, they are less attracted to some bird foods like nyjer and safflower seeds. Both seeds are bitter and the squirrel will ignore them unless they are in extreme hunger. Weight automatic system. 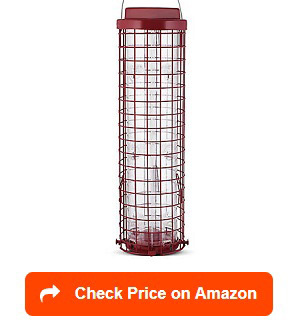 Many squirrel proof bird feeder reviews today have their own system of deterring the pesky squirrels from coming over. 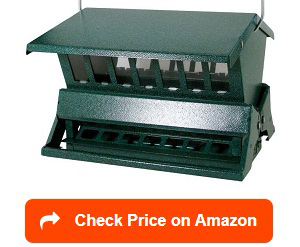 Get one with weight auto system and have peace of mind that your feeder is safe. Getting the perfect one will not be easy but it is still important to ensure that you find ways or two to keep the squirrels away as much as you can. It is the birds that needs feeding not the squirrels. Where to buy squirrel proof bird feeders? 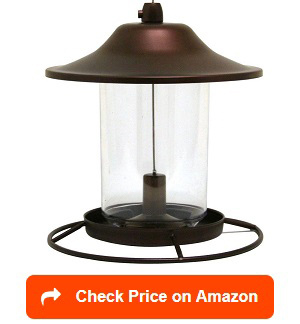 Buying a squirrel proof feeders can now be just by few clicks of your computer mouse. 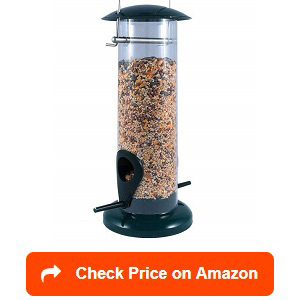 Amazon has great variety of feeders to choose from along with the correct seeds. You don’t really need to go out the long way. But if you are very traditional and wants to see, feel and bring home the feeder the same day, Walmart, Lowes and Home Depot might be your best choices. You can check quality of material, compare it with others on display and ask for guarantee papers right away. The possibility of getting a defected product is diminished tremendously. Your local pet shop might have some in their display as well and it is always a good idea to canvas products before making your final purchase. How to make a squirrel proof bird feeder? Wanting to be original? Then designing and creating your own squirrel proof bird feeder might be a good idea. Some of the most notable material you can use will be a PVC pipe, which is actually strong enough to hold the seeds. Getting it tightly sealed using a wooden base will ensure that squirrels will never damage it. The tighter the better. The best thing about is that you have the freedom to lengthen the seed container to make sure the squirrels will not reach the seed dispense area. Placing a thin perch area made of wire will also mean birds can rest while feeding but it is too flimsy to support the weight of the squirrel. Reach the seeds then makes it impossible. Make the feeder. Measure the feeder into 24”, which will be the body of the feeder. Fit and mark the base using a thick wood tightly sealed at the bottom. Drill it base plate so you can put it to put the perches later on. Cut perch slot on the side connecting to the base. This will keep the base secure and the perches sturdy enough for the birds but not for squirrels. Drill the feed holes, then put a smaller PVC so serve as baffle. The harder it is to reach the seeds, the better for the feeder. Birds have long beaks so it should not be a problem. Make the hanging loop, if you want you can create an illusion of spinner just to scare the little monsters away. 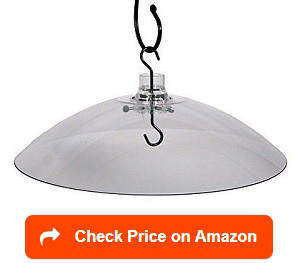 Once assembled, hang it outside within the birds level and at least 4” or higher from the ground. Squirrels can’t jump that high unless they have a ledge to support them. How to hang squirrel proof feeders? Get that squirrel off to do its job my hanging it at the perfect location. Yes, location is important as it can decide whether the squirrels will enjoy dining it in too or only the birds will happily come and enjoy the seeds. Having a wire that can be manipulated so it spins when an overweight object gets on the feeder is a great idea. Why not work on getting one and enjoy the squirrels falling away from the feeder every time they try. Avoid hanging them near the fence or any ledge. And by rule of thumb, hanging it at least 4” above the ground to make sure birds see it and squirrels can’t get into it. How to squirrel proof your feeder? Making your feeder squirrel proof means you can either buy a ready made quirrel proof feeder from stores or online or you can build a cage around your expensive feeder to only allow smaller birds and keep the squirrels away. The cage, made of metal, and chew off is ideal. I hate to say that I hate squirrels because I am pretty sure they do play an important role in the garden as well. In fact, I made a review about squirrel feeders – if you can’t beat them, feed them. They distribute seeds and help out in pollination but aside from these, they have more damaging roles than good ones, unfortunately. In this case, even long term birders who thought of putting up with the squirrel’s whims and voracious eating habits have given up. To continue doing so, finding the best squirrel proof feeder is the only way. 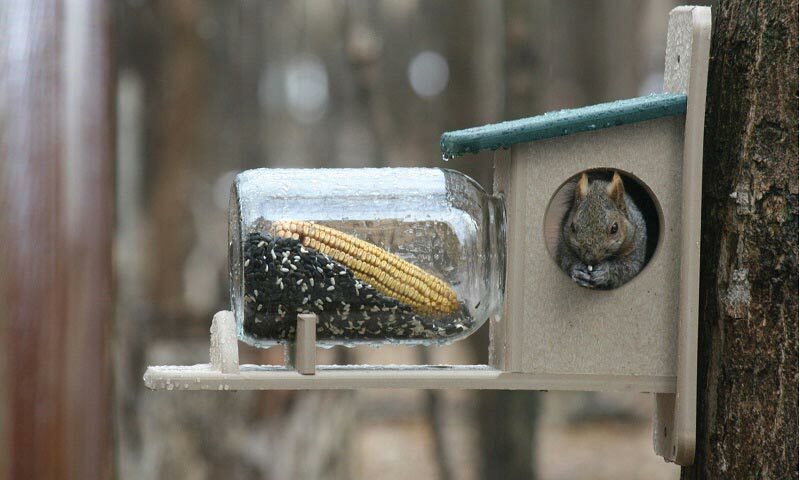 Good thing many companies have now came up with different versions of squirrel proof feeders. 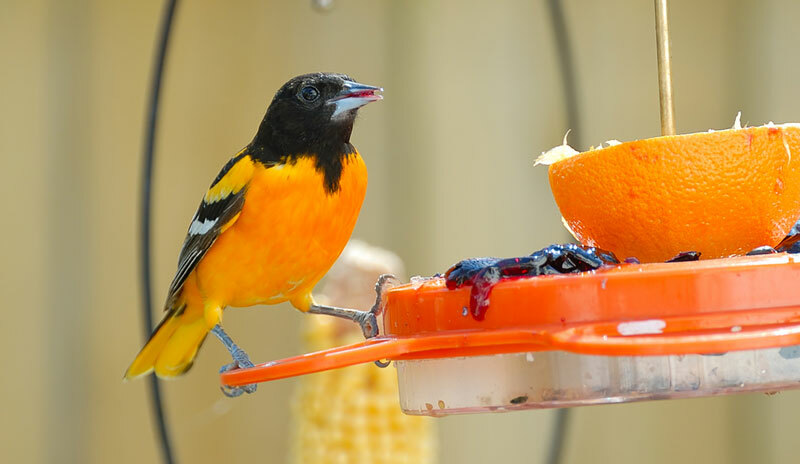 With a good squirrel proof feeder in your backyard, it is now possible for birders to enjoy their coffee while watching the colorful birds enjoy their morning food.